Facebook has changed their algorithms recently and you may have noticed you're seeing less from your favorite pages in your newsfeed. 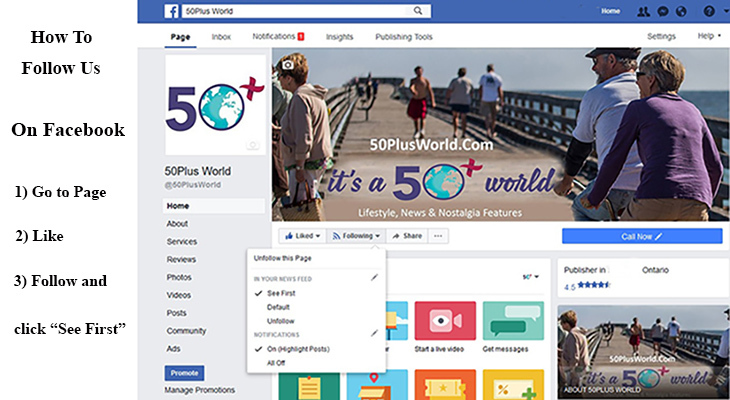 If you want to keep seeing what's new from 50+ World on Facebook, follow these 3 simple steps below to get our newest posts. Just below the 50+ World banner image, click the "Like" thumbs-up button. Click the "Follow" button beside it, and in the drop-down from that, check the "See First" preference under "In Your News Feed". That's all it takes to know what's new in a 50+ World!